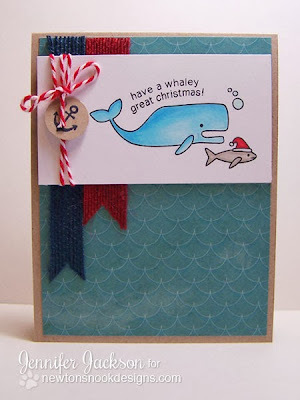 Newton's Nook Designs: Whaley Great Christmas! Having a Whaley Great Monday! I know everyone has been enjoying the snowman cards this weekend but I thought I'd switch gears a bit today and feature a card using our SEAson's Greetings stamp set! I think this is such a fun, unique holiday set! I love the idea of surprising someone with a funny whale for christmas! 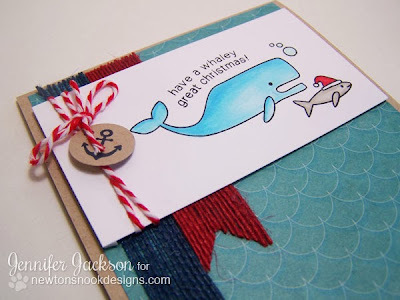 To make this card I colored the whale and little fish from this set using copic markers and then added them onto the card base with some fun wave paper and colored burlap! Then I stamped the little anchor on kraft card stock and punched it out to make a fun little embellishment! Hope you're having a Whaley great day! So darn cute. And that's why I haven't ordered yet...too much cute to decide on one! Off to gaze and admire once again, the send my order. Excited!! This is so sweet, I just love it. the cork anchor is the perfect touch!